This Dragonfire review was made after playing the game nine times. We were sent a copy of this game by the publisher in exchange for an honest review. 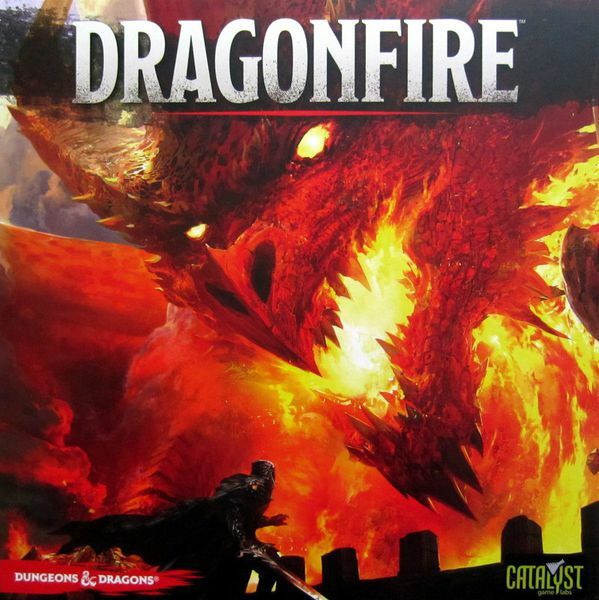 Dragonfire is a cooperative deck building game in which you and your friends take on different adventures inside of the Dungeons & Dragons world. It uses a similar game system to the one found in Shadowrun: Crossfire, but there are a few new mechanics added in, including Skill Checks. I’m not going to go over every rule in this review, but you should learn enough to know how the game plays. At the start of every game of Dragonfire, players will look at their character screens to see what Equipment Packs (starting decks) they get, their starting hand sizes, their health, and their starting gold. All of this will be based on the race and class of each character. You’ll also set up the market, which is made up of six cards that you will be able to buy and replace throughout the game. The adventure you choose to go on will tell you how you to complete setup and what you will need to do to win. Most of the adventures have a bit of story you can read in the campaign booklet, which sets the scene and helps you to get into character. The adventure card will also tell you any additional rules you’ll need to follow and the rewards you can potentially get. After you’ve read the rules for your adventure, you’ll place encounters in front of each player. Sometimes the encounters will have effects that happen as soon as they come into play, while others have reaction effects or effects that happen after they’re killed. The adventures are made up of Rounds and Scenes. A round ends after everyone in your group has taken a turn. Scenes end when you’re able to clear out all of the encounters. In most cases you’ll need to clear three scenes to beat the adventure. 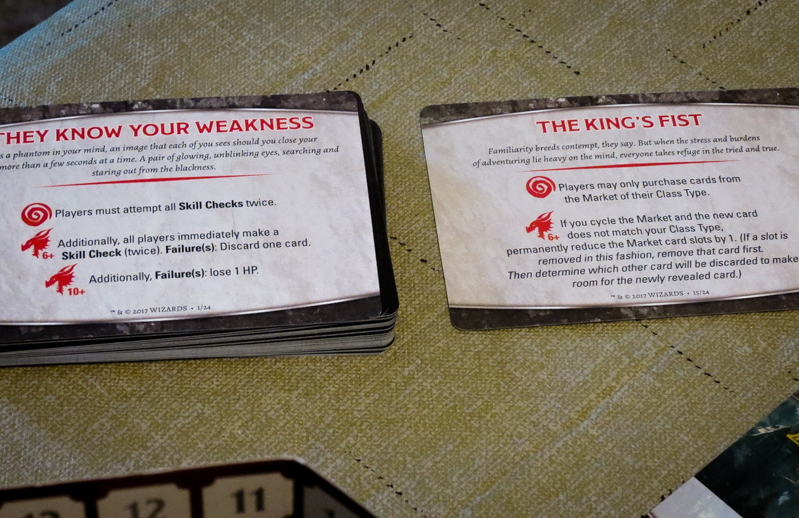 When a round begins, you’ll draw a Dragonfire card and read the text to see how it changes the rules for that round. The amount of Dragonfire cards in the discard pile make up the Dragonfire level, which makes the game even tougher as it increases. You’ll need to check the Dragonfire cards and the encounters to see if they add in even more negative effects based on the current Dragonfire level. Each turn you will be able to use your cards to try to take out some enemies. All of the encounters have damage tracks that will tell you the amount of and type of damage you’ll need to have to defeat them Sometimes you’ll have to have a specific type of card to clear a level of the track, sometimes it can be colorless (any color can be used). In most cases you’ll need to clear each level of the track from top to bottom, though some cards allow you to break that rule. You will also run into encounters that bring extra enemies (tokens) with them, which you will need to take care of before dealing any damage to that encounter. Unless you are on a location card, which is a special kind of encounter, you can go after any of the encounters in front of any of the characters, or even pull them towards you with some card effects. If you have a card with the Assist ability, you can play that card out of turn to help your teammates. When you defeat an encounter, the whole group shares the gold reward. Skill Checks and Saves, which D&D players will recognize from the tabletop RPG, are two keywords you’ll see pretty often in this game. When a card requires you to make a Skill Check, you simply draw your top card and check to see if it matches your character’s color. Encounters have the Save keyword, which is the same as the Skill Check except that you draw and check the top card of that encounter’s Encounter Deck. The cards will tell you what to do on successes or failures. After you’ve resolved all of your cards’ abilities and dished out damage, the encounters in front of you will hit back. After that, you can draw two cards if you have three or fewer cards left and then use your gold to buy new cards, which go directly into your hand. If your health ever reaches zero, you’ll immediately become stunned. At this point you’ll discard your hand and gain an Exhausted token, which means you’ll only be able to draw one card at a time during the Replenish part of your turn. A stunned character can’t buy cards from the market. If you take damage while you’re stunned or are brought down to zero health while you have the Exhausted token, you’ll become Unconscious and won’t be able to take another turn until the current scene ends. If you’re able to clear out all of the encounters on the table, the scene ends and you’ll enter a Short Rest. Here you can heal up (discarding the Exhausted token if you have one) and purchase new cards before moving on to the next scene. If you and your teammates clear all of the scenes, you win! Regardless of whether you won or not, you’ll be able to gain XP (during campaign play) based on how well you did on your adventure. The XP can be used to buy character upgrades in the form of Magic Item cards and stickers. You’ll choose all of your future adventures based on your Party Level, which is the average of each character’s current level. That might seem confusing, but Character Levels are simply determined by checking how much XP you have and comparing it to the Character Levels table in the rulebook. And that’s about all you’ll need to know before jumping into your first game of Dragonfire! Dragonfire is no where near as difficult to beat as Shadowrun: Crossfire, but it’s still a great challenge. One of the biggest complaints about SC is that it’s brutally tough, so plenty of people will be happy that this one is a bit more forgiving. You can still expect to lose a lot, but it never feels impossible (unless you play an adventure above your Party Level). Believe it or not, Dragonfire is actually very easy to teach. I had no problem teaching my group by going over the rules exactly as I did in the gameplay overview above, and then we basically just went over all of the new keywords as they came up. Yes, the rulebook is pretty huge, but only one person needs to read through it. This game is all about collaboration. You have to talk about which enemies everyone will go after each round before you take your turns or else you’ll be in a heck of a lot of trouble. Also, like in SC, the assist ability can help you save the day. Initially characters feel pretty similar, but as soon as you start adding cards to your decks, whether through deck building or by adding magic items, you feel like they are your own unique characters. You should definitely buy a bunch of cards of your character’s class type since a lot of them have extra abilities that can go off based on the character’s class and/or race. I always love when the cards you buy go directly into your hand. It adds an extra layer of strategy in Dragonfire since you can choose to buy a card that can help someone else that round or go for the big damage card that will help you clear out some enemies on your next turn. The game would be good even without the added story text, but the stories found in the campaign booklet make it feel like a more complete co-op adventure game. There is a massive amount of new content coming for this game. There is a lot of replay value in the base game’s box, but it’s awesome that we already know there will be more characters, adventures, and cards coming out soon. Oh, and the insert is excellent (I’ve had to deal with a lot of terrible ones recently). The Quick-Start game was clearly made for four or more players. I played a two-player game to try to learn the basics and we were destroyed, which doesn’t really make sense in a tutorial game. 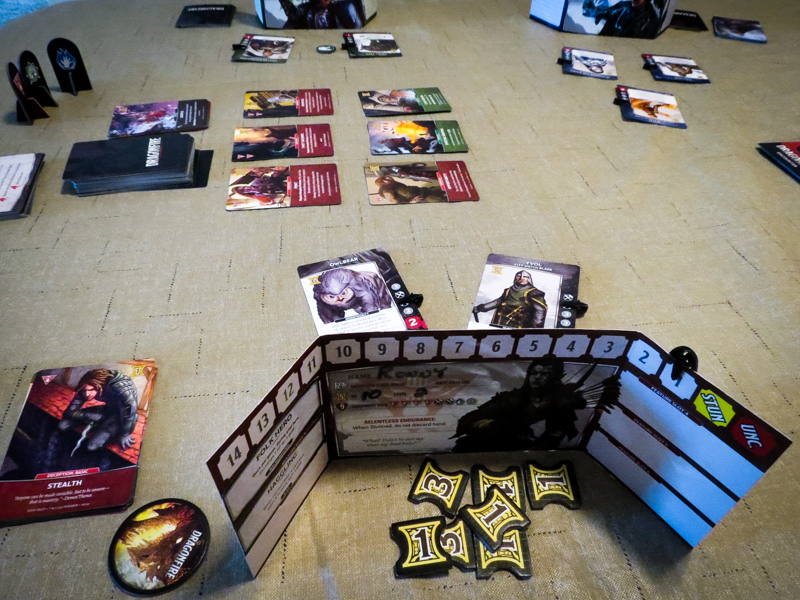 If you are playing a two or three-player game, I recommend skipping the Quick-Start game altogether since you really can learn the basics of combat and deck building in your first regular game. Plus, there are plenty of great gameplay examples in the rulebook that you can check out before you start playing. It might not be easy for some people to choose their first couple of stickers. Recognizing which of the stickers work best for the characters might not be obvious to newcomers to this type of game. You can always replace stickers later on, but that means you wasted stickers! Most of the people in my group don’t like the look and feel of these character screens as much as the ones in Shadowrun: Crossfire. The images don’t pop off the paper as well as they do in SC and you can’t remove the stickers as easily. The screens don’t look bad by any means, but they could definitely be better. The clips are a bit tough to get onto each encounter card. I’m not actually a fan of clips most of the time since they often scratch up my cards, but this obviously won’t be a big issue if you decide to sleeve all of the cards. 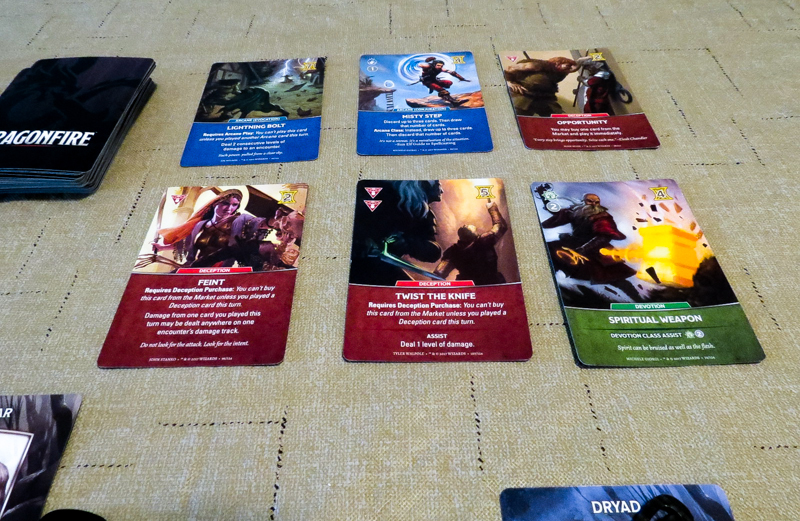 Dragonfire is a fun, exciting, and challenging adventure / deck building game. We’ve won about half of our games so far, but most of them have gone down to the wire and we were happy to get that sweet XP even in defeat! I don’t know if Dragonfire is better than Shadowrun: Crossfire yet. I never had a problem with SC’s difficulty, but I think anyone who thought SC was too tough should give this one a try. I like the theme in SC a bit more, but there is more of a story going on in Dragonfire and you can do more to upgrade your characters. My group has played SC a lot, so we’ll need to get in 10+ more games of Dragonfire before we decide if it should replace SC on our Top 5 Deck Building Games list. I’m actually happy to own both since they are set in two very different worlds. I haven’t played enough D&D to say if fans of that game will like this one or not. What I can tell you is that they have included many of the characters and settings from D&D and that the artwork is great. Anyone who likes D&D and also happens to enjoy deck building games will probably love this game. If you’ve never played SC or D&D and just want to know if this is a good deck builder… Yes, yes it is. You’ll see new, tough enemies every time you play a new adventure and there are some very cool cards that you can add to your deck. We absolutely will continue to play Dragonfire and can’t wait to play some of the future expansions! Thanks for taking the time to read our Dragonfire review! To stay updated on all things cooperative board games, follow us on Twitter, Facebook, or via RSS.